After Indian Prime Minister Narendra Modi's call to BRICS leaders to create a group sports council with soccer meets, Russia's Vnesheconombank and the Russian Consulate in Mumbai launched the first BRICS football tournament with India's South Kickers Soccer Academy. The tournament was held last weekend in Mumbai. Six local children’s teams and a team of players from the five BRICS countries, drawn mainly from the diplomatic and business communities, participated in a BRICS football tournament at Mumbai's Cooperage Football Stadium on July 25th, 2015. "The idea to organize such an event between BRICS countries is in tune with Narendra Modi’s proposal at the Ufa Summit to hold an annual BRICS football championship. This BRICS mini-cup in Mumbai was suggested by Consul General of Russia Alexey Novikov, and today we are happy that we could not only bring this idea to life but also bring children of our five nations together,” Sergey Kotlyar, Russia’s Dy. Consul General in Mumbai said. From the outset, the tournament has received active support from diplomats from Brazil, Russia, India, China and South Africa, and was conducted in a very professional way. “I believe it is not only the trophies that the children enjoyed, but the extremely friendly atmosphere as well. Now we are looking forward to another wonderful idea by the Indian Prime Minister, concerning a BRICS film festival, to take shape," Kotlyar said. Representatives of Vnesheconombank’s (VEB) Mumbai office, with the Russian consulate and Indian partners, including the South Kickers Soccer Academy, joined efforts to turn the idea of uniting five BRICS nations through football and other sports to reality. The event was organized under the aegis of VEB annual sports festival, “Partners of the 21st Century,” held every summer in Russia. “Following this old tradition, we wanted to time this BRICS mini-cup to the games that are taking place in Moscow next month,” Alexander Perminov, head of Representative Office of VEB in Mumbai told RIR. “We were also very happy to hear India's PM Narendra Modi saying that India will host BRICS football cup next year at the latest BRICS summit in Ufa. We believe some of the children whom we have seen on the field today will play in the grand BRICS football cup someday”. 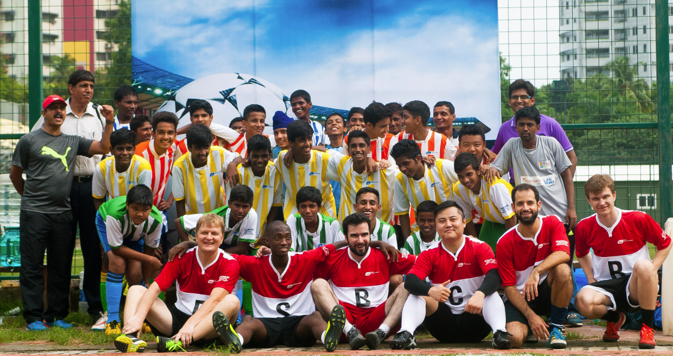 The BRICS mini-cup brought together six children teams from different parts of Mumbai, India's financial hub. These included St. Mary's SSC team from Mazagaon, Campion School team from Cooperage, Magic Bus team from Worli (finished in fourth place), Navy Children’s School from Kolaba (third place), Wokhardt Foundation team and St. Stanislaus High School team from Bandra, who finished in second and first place respectively. The BRICS team that played with children at the tournament comprised diplomats and businessmen from all five BRICS. “This event was a great success and great fun too,” Jeffery Campus, Head of South Kickers Soccer Academy said. “I am quite sure that with the help of our Russian friends, and other BRICS nations, we will continue conducting similar sports events in other disciplines, since it gives our children not only experience in sporting but the great exposure into global world”. Pule I. Malefane, Consul General of South Africa, who played for the BRICS team at the tournament along with his eldest son, believes such events help change the common perception of BRICS as an academic establishment which doesn't really involve the common man. “I think that what we have seen today at the soccer ground is that BRICS idea cascaded to sports. The relationship that leaders of our countries developed so far allows greater openness, making it possible to share information between each other for prosperity and progress of humanity in the whole world. Because BRICS is not just five countries, BRICS is about representing five continents,” he said. “We want to see peace, we want to share economic opportunities among our nations. Bringing these ideas to ordinary human beings is the main aim of events like this tournament”. Malefane pointed out that BRICS should be understood not just as an academic exercise or agreements signed between leaders. “We need people of our nations to identify opportunities, to decide their role in civil society. We need to explain that BRICS is for people, it's theirs. BRICS is about human development and it must be seen as such,” he said. Xiong Pengfei (Arthur), Consular Attache at the Chinese Consulate in Mumbai, believes the tournament was a good start in promoting the conception of BRICS. “I think this conception is very good on many levels, not only economic, but social and cultural ones,” he said, adding that if five BRICS nations want to cooperate in economic field, they have to know and understand each other. “We have to overcome such a big challenge as stereotypes that can totally ruin the exchange between countries, and these socializing events can definitely help that”. The children who participated in the championship definitely agreed. For many, it was the first time they had heard the BRICS acronym. If, initially, some of them put “Ireland” for “I” and “Spain” for “S” while getting totally confused about “R”, by the end of the tournament none of them would mistake BRICS for anything else than Brazil, Russia, India, China and South Africa.